While looking for some decent things to add to my Netflix instant stream queue - I ran across this documentary called - Just for Kicks. 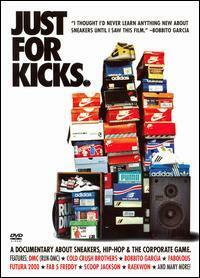 A documentary behind the subculture of collecting sneakers. All in all, the doc was an enjoyable viewing… a little too NYC centric at times. I think good sneaker design doesn’t get made in “Brooklyn”. Wish I could seek out sneakers more aggressively but they never have anything in my size (15).